The turn of the first millennium was experienced by people of that time not with fear that the world was coming to an end, but rather with hope that the world would be renewed, as 'the promise of a new Spring'. Thus, Christ's Passion came to symbolise the resurrection of the Church; a great reformation began. 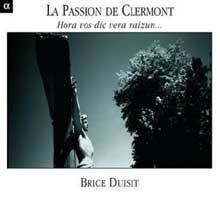 Seen in that context the lyric poem La Passion de Clermont takes on its full meaning. Brice Duisit performs vocals and vi�le a archet.